Psychic Light & Soul is run by Sonia Berridge who provides West Midlands Psychic Readings, One to One readings, group readings and Spiritual Counselling. She required an appealing design to compliment her existing business but at the same time for it to be fast loading and user friendly. Umbrella Web Studio developed her website to provide a quality user experience for her existing customers and convert new customers into sales giving her an ROI. We have also built the site from the ground up and implemented SEO techniques as standard and has a SEO campaign in place for which she is now placed on the 1st page of Google for many of her search terms. 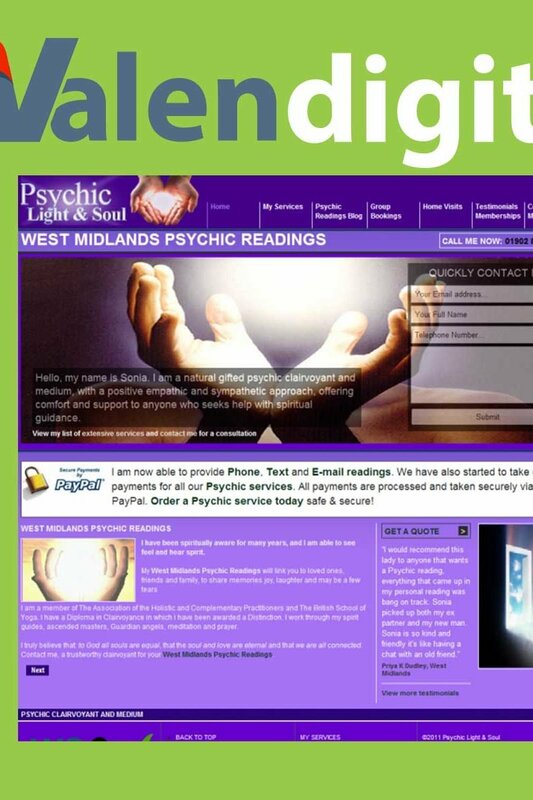 The Psychic Light & Soul site was built from the ground up to be W3C compliant, which means that every browser is able to see the site as it should be and is friendly for disabled users.